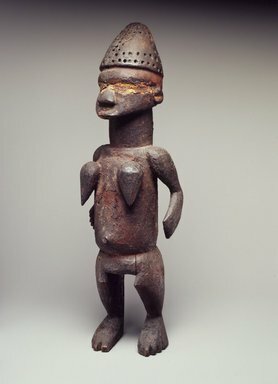 Standing wooden female figure with downward pointing breasts, a pointed navel, and bent arms hanging free from the sides of the torso. Hips and legs are exaggerated in form. Its headdress is conical in shape with circular indentations. A strip of white paint covers the eyes. A heavily encrusted patina covers the surface of the figure. CONDITION: A thin check runs from the top of the headdress through the forehead to the right eye. Another runs from the left side of the abdomen to the top of the left leg. There is a hole in the stomach near the right breast. There are two checks on the right side of the face and one through the back near the right shoulder. Both feet have been broken off at the instep. A wooden dowel from the base remains in the broken portion of the right foot. Two splinters of wood remain from the break. Small amounts of patination were removed by the rough tissue paper packing. A heavily encrusted patina covers the surface of the figure.Photographs have been taken of the above break and packing after the box was opened. Piece repaired by Conservation Dept. 5/74.